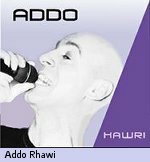 It is a new kind of music that Addo presents on his latest CD "HAWRI" - which means "my friend". He connects Rap, Reggae and Pop with traditional Assyrian/Syriac folk-songs. For 20 years Addo has kept himself to traditional Assyrian/Syriac folk songs, but now he makes music for himself and a younger generation of Assyrian/Syriac people. "Normally I would have made the CD even more "Rocky", but then I chose a wide spectrum of music, to get more and more young people to listen to there mothertongue. They are the ones who carry on our traditions. Modern music with text in one's own language strengthens self-confidence and identity," says Addo. At 17, he got an acoustic guitar as a present from his brother and started to play music with some friends in a basement in Ronna/Sweden. So, his first Band named "Bethnahrin" was born. Their first gig was in an old basement of the Assyrian Association in Ronna. The atmosphere was fantastic, the crowd both young and old danced constantly. Addo, who has previously been in three bands, has, during 20 years managed to play hundreds of Assyrian festivals and weddings. During this time he and 4 other band members recorded 4 cassettes, where he customized both music and text to suit the audience. There is not a big market for Assyrian/Syriac music and there are a few Assyrian/Syriac musicians who make a living from their music. Musician Janne Perning was the one that got Addo to realise he is musical thoughts. Perning, who produced Addo's latest CD "Hawri", is an established musician who has toured with "Ace of Base" and "Dr Alban". The recording of "Hawri" took roughly one year. Addo has written all the music and lyrics to his new CD. He likes to write about things close to his heart: children, family, friends and his ethnic identity. Despite the fact that much of the material on the new CD is new there are two old favourites from earlier recordings, namely "Tihe leshonan", a popular tribute song to the Syriac language and "Semoqo", which means "bloodred".